Yes, I’m a grown man. But I dig children’s literature, especially picture books. I admire creators of these wonderful works of art — authors and artists. So you can imagine the excitement I felt when I discovered a new book on the horizon, illustrated by an artist I admire, Kadir Nelson, about the President-elect whom I admire, Barack Obama. 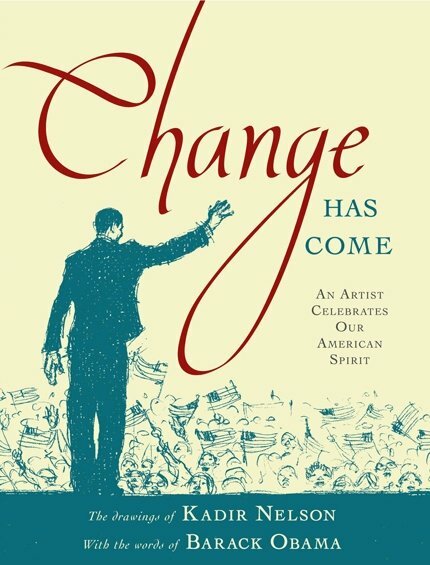 Change Has Come: An Artist Celebrates Our American Spirit. 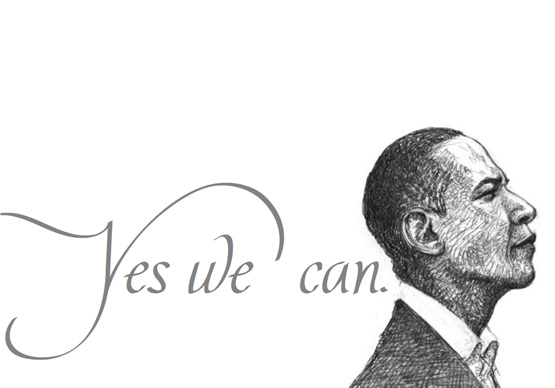 Drawings of Kadir Nelson with the words of Barack Obama. Simon & Schuster, Jan. 09. Don: Tell us a bit about your book. Kadir: CHANGE HAS COME is a keepsake book to commemorate our new president. It was created very spontaneously with black and white sketches and drawings that celebrate our great American achievement. 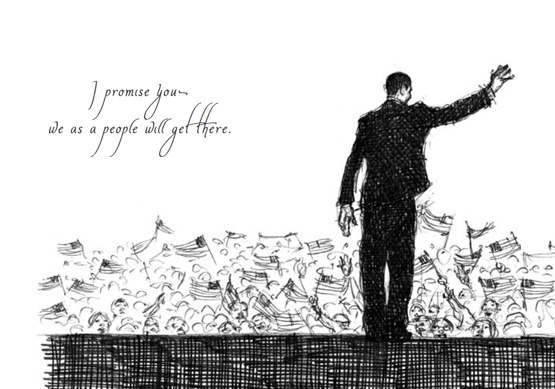 It is punctuated with quotes from Obama’s speeches from the last four years. Don: Other than Barack Obama himself, what inspired this book? Kadir: I really had no intentions of doing any Obama books anytime soon since there were already a great number of books about him on the market. I felt that Nikki Grimes and Bryan Collier did an outstanding job with their picture book biography, so there was no need for me to be redundant. However, the folks at Simon and Schuster presented me with a unique idea–a sketchbook of celebratory sketches that would serve as a beautiful keepsake. I loved the idea immediately. The only challenge was getting it done in time for a mid-January release, which meant I only had ten days to create the artwork! Don: What were your thoughts/feelings/emotions on election night? Kadir: I was actually painting while keeping an eye on the election results on the computer. I was, as they say, “cautiously optimistic.” But, I knew as soon as Pennsylvania went for Obama that it was only a matter of time. I was so proud of America. That night was like magic. It was a wonderful sight to see the Obama’s take the stage after the election had been called. Don: Will you sell the original art after the book publishes? Kadir: I think I may sell them. Creating the drawings for this book, and recently exhibiting drawings in Kansas City with a friend and artist, Shane Evans, has really re-sparked an interest in drawing for me. Having painted so much, I almost forgot how much I love to draw. Don: Thanks for squeezing this project in, it will definitely be a keepsake I’ll treasure. Newbery’s, Caldecotts, CSK’s…do kids care? I am looking forward to this release. Hey Don I know this is a silly question but what is the difference between drawing and painting. I think its pencil and paints let me know if I am even close. Which do you prefer and why? Oh my soul I can not wait for this book to come out! Obama’s words are so inspiring and wise. I can’t think of a better way to celebrate! Doret– painting is with watercolor, oil paint, tempra, acrylic paint. Drawing is with pencil, pen, charcoal. Good question though. I had to think. Don, I am with you. I am a grown woman and I, too love children’s books, especially picture books. They are the best. I saw this book in Target this month and loved the drawings. Going to go back and purchase.